With his recent passing I've been going back and rediscovering David Bowie, so every once and a while I'll be posting some cool Bowie-related articles and videos. In this case Rolling Stone has had two articles this week showing different aspects of Bowie. 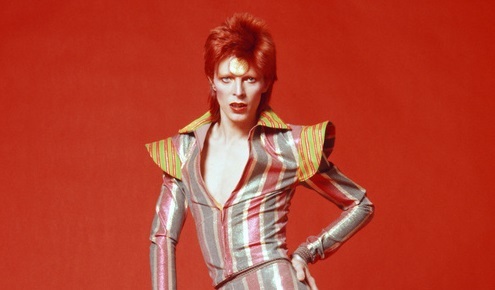 The first is "How America Inspired David Bowie to Kill Ziggy Stardust with 'Aladdin Sane'' http://www.rollingstone.com/music/news/how-america-inspired-david-bowie-to-kill-ziggy-stardust-with-aladdin-sane-20160413, a look at the making of Bowie's 1973 album and how it inspired him to lay Ziggy to rest. The second one is "How David Bowie, Nile Rodgers Made 'Let's Dance' a Hit http://www.rollingstone.com/music/features/how-david-bowie-nile-rodgers-made-lets-dance-a-hit-20160414, looking at the collaboration between the two and how the hit single pushed Bowie onto the pop mainstream. Check those two out and also watch the videos for "The Jean Genie" from Aladdin Sane and "Let's Dance" below.